Sometimes, as with Seahawks Guy, an optimistic tattoo turns out to be prophetic. Other times (most times?) 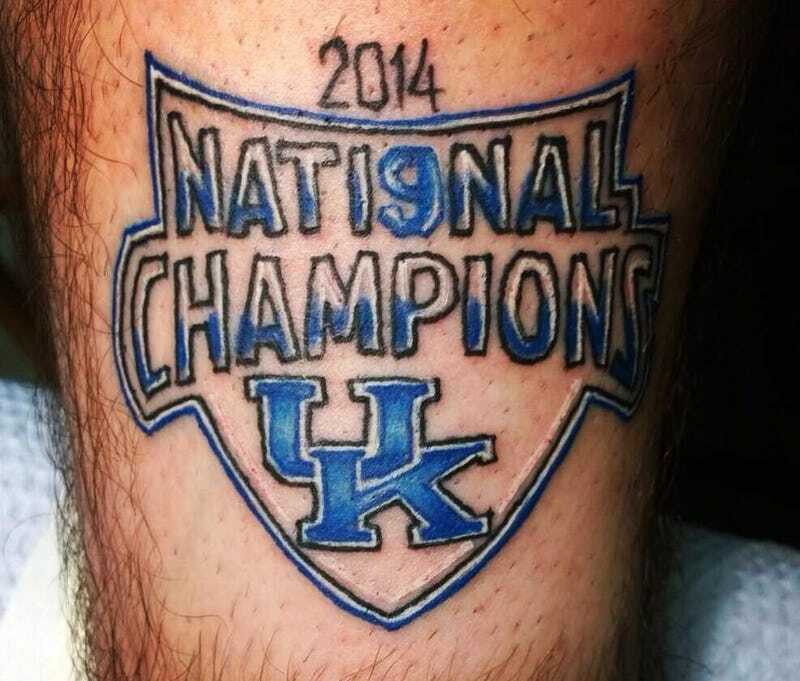 it turns out like it did for Kentucky fan Tyler Black, who went and got this "2014 Nati9nal Champions" tattoo before the tournament. After UConn defeated UK last night, let's check back in with Black. Though Kentucky went further than anyone thought possible, it all came to an end. But Black tells ESPN.com that he's going to keep the tattoo, unaltered, to remind him of this unlikely Wildcats run. ""I'm keeping it," he said. "It's a way to remember this team and it's part of my life story." Black was in Texas for the championship game, he and a friend provided free tickets by CBS after news of his tattoo went viral. (You should probably get that "Diamondbacks World Series Champs" tattoo now, on the off chance they make a run and you'd like to attend free playoff games.) You can track the progress of their night from their Twitter accounts, and vicariously experience the agony of defeat.